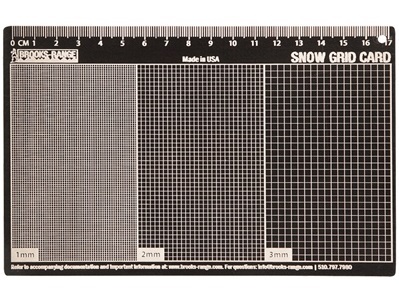 This aluminum card has laser-etched grid lines to help you gets a sense of snow-crystal size. With 1mm, 2mm, and 3mm lines, you can quickly analyze crystals in the snowpack. 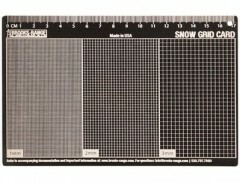 The grid is black so you can see the white snow, and features textured grid lines to help keep the snow in place. Fits neatly into a book. Unlike the rival BCA models, which only include 2 sizes, this includes 3, which makes it a little easier to visualize crystal sizes. Its also a little less cluttered and more of a pure measuring tool, without codes for crystal types.